Whether you're a ladies' night devotee or a last-call dilettante, set the style this season in this scene-stealing Scully® blouse. Embroidered floral soutache overlay adds a gorgeous feminine look. Lightweight woven cotton in a chic, breezy fabrication. Ribbed panels at the side seams add just enough stretch for lasting comfort. Tailored darts shape the feminine silhouette. 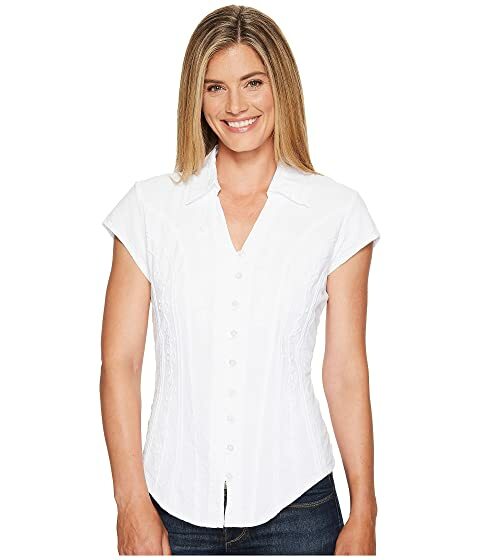 Button-up blouse with button-loop placket.